It’s time for fluffy wooly jumpers and snuggly UGGS. The cold has arrived. Aah…. autumn en France, is a quick skip-step-and-a-hop to winter. Despite the cold there are perks to winter, such as, beautiful sunshine, many cuddles under blankets and warm beverages. MadCharlotte’s French chocolat chaud is one of the best perks of winter. A chocolat chaud however is made even better by adding an OREO marshmallows. This winter, MadCharlotte is launching MadCharlotte marshmallows. Floating in your chocolat chaud, these artisanal made-with-a-whole-lot-of-love marshmallows become a cloud of sweet frothiness. It’s a whole-lot-of-fun mixed with a ton of delicious! Ouh la la!!! J’en veux! Pictured above are OREO marshmallows. The best! Cuddle up this winter with MadCharlotte. Feel’n the love. It occurs to me that I’m not very familiar regarding the history of Persia (Iran), nor Persian people. However, when I think and say the name, “Persia”, it evokes beautiful ideas, even some childhood fantasies. A story of Aladdin’s flying carpet, Persian cats, genie in a bottle and wishes coming true. As a young girl how I envied those beautiful Persian women, their flawless fair skin in contrast with their long flowing dark hair. I’m still waiting to have both plus a few wishes come true. Persia, gives a mystical sense don’t you think? Patisserie has in fact brought me back to mystical Persia. The best quality pistachios come from Iran, the former Persia. I find myself in the 15th arrondissement in Paris (earlier I Googled: Persian ingredients + epicerie + paris) in the Iranian epicerie district. What a discovery! It is truly a trip to Iran. I felt like a major tourist. I’ve never seen so much choice for pistachios! I’m spoilt for choice. I’m seeing rare and precious ingredients such as dried rose petals and buds, sweet delicacies some of which I recognise but mostly I’m in foreign land. Now my mind is flowing with ideas. Change game plan. MadCharlotte is in Persia, and is here to stay, for a while. Turning fantasy into reality is the first wish to make come true, that is, after installing a GPS on the flying carpet. 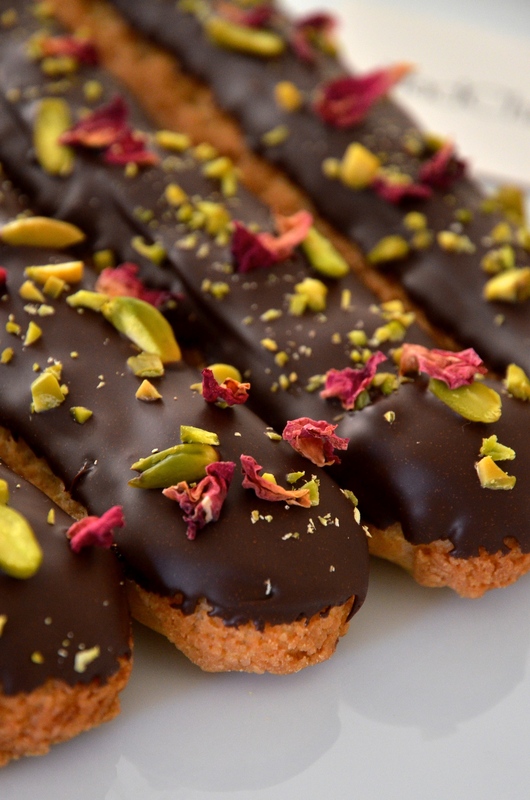 Persian eclairs: Iranian pistachios and rose petals decorate a pistachio cream filled eclair. Chocolate garniture is French couverture chocolate. MadCharlotte Marshmallows or Guimauve en francaise have a delightful squishy-squidgginess which comes from making an Italian meringue and then swirling through coconut puree. Very mellow mallows! Coconut shavings enrobe these pillow delights. MadCharlotte marshmallow ” Guinguettes” collection! Inspired by les Guinguettes popping up all over Paris and Parisian suburbs over the summer, particularly my favourite called La Javel located by the River Seine. Raspberry marshmallow Guinguettes are fabulously social. Let the cabaret begin! Let’s dance! Let’s drink! Just bring yourself, and don’t forget friends, and let’s have a fantastic time! MadCharlotte’s Le Paris Cheesecake like her New York sister is baked and creamy as. What makes her Parisienne to MadCharlotte? It’s the addition of fresh fruits. In France, we are in July/August which means we are right in berry season. Those red fruits, the raspberries…. oooh…just so damn beautiful that it seems an injustice ONLY to eat them alone. If berries are speaking to me they’re definitely saying “Put me with an already awesome dessert and together we’ll totally kick-asse”. And as I know the Frenchies are huge fans of the old New York Cheesecake, I thought about how I can marry a little anglo with a little franco… Et Voila! Laduree, Champs-Elysee the year 2009. I discovered the famous French dessert classic, Le Saint-Honore. There’s more, it was the flavour combinations that caught my attention. I’d never tasted ROSE. I’ve certainly never tasted raspberries and rose together. “This officially is my favourite dessert. I must learn to make it”. It all began here. Laduree, Champs-Elysee, the year 2009. It was not only the flavour combination but the textures. All that is so great in French pastry I believe to be in this one dessert. At least all my favourite things of French desserts. Let’s break it down. It’s a lot of work. But it’s well worth it. I really enjoying making this particular dessert because it involves so many aspects of patisserie. I will of course be making more of the Saint-Honore in different flavours and styles. The styling for this particular photo comes from an influence of now living in Versailles. Le Chateau de Versailles is only footsteps away from my studio and I’m feeling very much like Kirsten Dunst in her role as Marie-Antoinette. But more recently the Chateau de Versailles celebrated its annual event, Le Grand Bal Masque (The masked ball) with attendees dressed up in costumes of the time, Baroque style which includes wearing masks all evening leaving much intrique to a very fun and perhaps naughty evening.